We wrote this piece for Sawbridgeworth Town’s match day programme on March 17th 2018, which was postponed but then played on March 20th. The home side won 4-0 as Clapton played a team full of trialists. Good afternoon all and a big thanks to Sawbridgeworth Town for the invitation to contribute to today’s programme. I think all Clapton supporters would agree that the spirit of friendship and cooperation extended by the majority of Essex Senior League clubs has really helped put a positive shine on what has otherwise been a gruelling season. As an awayday, Sawbridgeworth has always been a stand out fixture for us. It’s an easy train ride up from Stratford and must be unique in its pubs to per head of the population ratio. It’s also the sort of place that if it wasn’t for following non-league (or for those with an interest in antiques), many of us East Londoners may never have discovered. Our hosts today might not thank us for saying this, but even with its leafy location, Crofters End definitely has a feel reminiscent of our much missed Old Spotted Dog. That’s not to say, however, that Clapton have found this to be a home away from home, with just one league victory here in the last 5 years. Although we’ve often struggled on trips to Hertfordshire, there hasn’t been much to choose between Clapton & Sawbo in terms of league position in recent seasons. Both clubs have been mainstays in the top half of the table, with 34 goals traded between us since 2012 – 17 apiece! From a supporters’ point of view, it’s the guarantee of goals in a hard fought fixture that gets the blood pumping on a Saturday. With our boycott of home matches now in its seventh month, we’ve missed our usual weekends, which makes fixtures like these all the more special. Clapton Ultras started in 2012 and joined with existing fan group at the time, the Friends of Clapton, in trying to raise the profile of the club. We have had some fantastic highs over this period, as our attendances went from single figures to the high hundreds, although we find ourselves now at a difficult point. Clapton aren’t alone in going through a tough time off the field, with a number of non-league clubs from London and the South East struggling through this season. It’s the community around non-league, however, that has shone through and has demonstrated to everyone how important it is to support each other. We all wish Sawbridgeworth Town a good game this afternoon and the best of luck for the rest of the season. Expecting another close one. It’s Non-League Day this weekend, the annual celebration of football lower down the pyramid. With no football in the Premier League or Championship due to the international break, it means the spotlight turns to non-league football. This year everything has fallen perfectly into place. Fans have been boycotting home games, but Clapton have been handed an away game. Hurrah! And as luck would have it, it’s ‘away’ at Hackney Wick FC, who play at the same ground as Clapton. The game takes place on Saturday, 7th October 2017 at 3pm. The venue is the Old Spotted Dog, 212 Upton Lane, Forest Gate, London E7 9NP. The nearest stations as ever are Plaistow, Forest Gate and Wanstead Park. However, there are some weekend engineering works so check the TFL website. If all else fails, it’s a 20-25 minute walk from Stratford station or jump on the 25/86 bus or a taxi at the rank outside. For this game, Hackney Wick FC have pledged to donate half of the match takings to the charity Scope. Bravo! Hackney Wick are a merger of a club of that name who played in the Middlesex League, and long-time Old Spotted Dog tenants London Bari. They also have a women’s side and eight youth teams. No, there are no advance tickets, everyone pays at the turnstiles – in cash, no card! This is non-league football, not the Premier League. Get there any time from about 2pm. The earlier the better as it should be a big crowd. Where do I sit or stand? There is a small seated main stand which fits 100 people only. So if you want a seat, get there early to bagsie one. Otherwise you can stand anywhere around the ground including grass banks behind both goals. There is also a covered terrace, recently extended, called the Scaffold. This is the traditional home of the infamous Clapton Ultras. If you want to join in singing non-stop for 90 minutes, as well as before and after the game, these are the people to seek out and stand alongside. However, space there is at an absolute premium, so if you are wanting a more chilled experience – a chat with your mates, check your phone, take photos, maybe a bit of a rest from singing, it really is best to stand elsewhere. You’ll get a better view too. Yes, for Clapton home games. At the start of the season, supporters group Real Clapton called for action in the wake of the club’s chief executive attempting to liquidate the leaseholding charity that runs the Old Spotted Dog. With the club’s home for nearly 130 years in peril, RC called on fans to donate to a legal fund to try to stop this happening, That matter is currently awaiting a date in the high court. They also asked supporters to take the hard step not to go to home games, as their admission fee would essentially be helping to fund the high court attempt to liquidate the OSD. This call for a home game boycott was supported by the Clapton Ultras and has meant attendances have fallen by 81%. And that’s not taking into account the club over-stating attendances massively this season. In reality virtually no one is paying to go into home games now. So until there is an end to the boycott, this is a rare chance to see Clapton play in front of a packed Old Spotted Dog. Why does the boycott not apply for this? Because it’s an away game. It’s a simple as that. 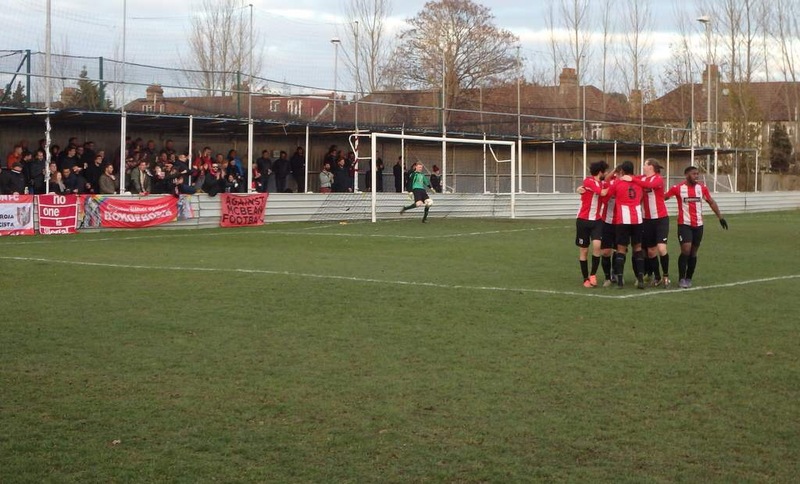 Real Clapton have only called for a boycott of home games to avoid funding the legal action. Hackney Wick share the ground but are a different entity. What about the insurance issue on the Old Spotted Dog? Real Clapton are also concerned that the Old Spotted Dog may not have public liability insurance given it is currently in the hands of a liquidator. Clapton FC itself insists that it had already automatically been renewed so there is no problem. It’s hard for us to prove either way. We are not insurance experts. So we would just advise people to be careful and be aware of any hazards. Yes, the Clapton Ultras will be holding on their regular food bank collections for RAMP, based in nearby Manor Park. This used to take place inside the ground but the Clapton chief executive banned this a year or so ago. So you will now find the collecting point outside the Old Spotted Dog pub next door to the ground. The Ultras have requested tinned food ONLY for this one. Foodbank for RAMP (small tins of food only, pls) on Sat – see you at the Dog! Meanwhile, Hackney Wick say there’ll be various activities, including a crossbar challenge, raffle, penalty shootout and correct score challenge. The Essex Senior League has finally released the fixtures for the forthcoming 2017/18 season and the first handful of games feature some new faces as well as familiar faces and old rivalries. Clapton start the season this Saturday away to Basildon United at the Stuart Bingham Stadium – a repeat of our opening fixture in the 2015/16 season. The Bees have appointed the former Basildon Town management team of Mark Harrison and Liam Wallace in the summer, following the departure of Aaron Bloxham. Former assistant manager Lee Connor has been appointed as the club’s new chairman and will be hoping United can improve on their 9th place finish last season. The following Wednesday we travel to Cricklefield Stadium to face our old rivals, Ilford. It has been a summer of uncertainty for The Foxes after they were controversially voted out of the ESL at the AGM. However they successfully appealed to the FA and have now been reinstated. Former Clapton captain and current Ilford boss Allan Fenn will be hoping for a title challenge this season after signing a string of impressive players including last season’s league top scorer James Peagram who netted 45 times in all competitions for champions Barking. Following our trip to Clacton in the FA Cup, we return to league action on Saturday 12th August for our first home game, against Woodford Town 2017. Woodford is the new name of the team formerly known as Haringey & Waltham, and going further back Greenhouse Sports, Greenhouse London, Mauritius Sports Association and Mauritius Sports & Pennant. Town have a familiar look at least in the dugout, with former Wadham Lodge manager Tony Ievoli taking the hotseat, assisted by former Tons assistant manager Neil Day. It is not known what links the setup has to the historic Woodford Town who, with Vince McBean as their chairman, shared the Old Spotted Dog with Clapton in 1999 before going bust in 2003. Woodford, whose Snakes Lane ground burnt down but has not been redeveloped, will play at Broxbourne, where Eton Manor were based last season. We then travel to Mile End Stadium on Friday 25th August to face Tower Hamlets. Last season 308 fans piled through the gates for the corresponding fixture, also on a Friday night, and no doubt Hamlets will be hoping for a similar or increased attendance this season. AJ Ashinike has returned as manager and has recruited some impressive looking players, including former Barking and Ilford hotshot Wale Odedoyun and will be hoping his team can improve on their 20th place finish last season. The rest of the fixtures are still being finalised and will be put on our fixtures page soon. With just days until Clapton’s pre-season officially kicks off, uncertainty continues to dog preparations, as questions remain over the ground’s liquidation. Following the Essex Senior League AGM in June, Clapton released a statement confirming the club had secured its league status for the 2017/18 season, adding that the home venue will continue to be the Old Spotted Dog. However, it is still unclear if the ESL and the FA have received the assurance they needed over the ground’s viability as the leaseholding company attempts to go into voluntary liquidation. Both authorities had given the Tons – and fellow tenants Hackney Wick FC – a final deadline to prove they had the right to play at the OSD for the full season. But sources have been left scratching their heads as to how that undertaking could have been provided while the liquidation process is at a stalemate. Further court proceedings are due later this month. Nevertheless, preparations for the new season at the Old Spotted Dog visibly continue, with the grass mown and the lines marked out. The pitch appears to be wider than last season, with a previous marking that can be a yard or so inside the pitch. Five games are scheduled to take place before the league season kicks off on Saturday 29th July. The league fixture list isn’t due to be released until mid-July, however, as the ESL must wait for the Isthmian League list to be completed. Our first FA Cup game should take place on Saturday 5th August. The draw will be made on Friday 7th July with both Clapton and Hackney Wick publicly saying they are included. We’ll have lots more on this game in the coming days. A bus-only awayday. A welcome break in a somber boycott. A Tons team in serious form against our cup-winning ex-manager’s new club. We’re calling it now: this weekend’s visit to Stansted is going to be Too Much.We have to start with the obvious. It’s poignant to be reunited with our old gaffer, Mike Walther, especially with everything that has been going on at the Old Spotted Dog lately. After all, Mike had a seriously strong squad, an historic Gordon Brasted Cup Final victory (against Stansted, funnily enough), and a crowd of supporters whose respect he had earned the hard way. Yet he still looked at all of this and opted to take up a less senior position at Stansted. What, asked everyone, could have attracted him to a job twice as far from his Canvey home – or driven him from Clapton? We can expect to see some old friends in the home XI, too. Cup-winner Euan Taylor Reid recently rejoined Walther in a side now captained by our much-missed fullback, Luke Kanjor. However, the exodus of players following Walther north never materialised. And while Stansted are having a season of fits and farts, though, Clapton go into the game with their tails high. The Tons’ (probably) historic away league form has already been noted. The 2-1 win FC Romania was the seventh away league win in a row. Arguably it was the most impressive of the lot, with the team bouncing back from a home equaliser to seal the points with real authority. This away form is a real boost for fans who are opting not to attend home games – and the win at FC Romania was all the sweeter for this, and the opportunity to demonstrate their unity with the players. But the focus on the away run will have given way to a slightly more disconcerting sense of anticipation after Tuesday’s 4-0 hammering dished out to Basildon. Any Ultras who stole a glimpse of Tuesday’s game through the fences saw a team playing with genuine threat. Jay Knight, who got both goals at FC Romania, was partnered up front by another returning hero, Ike Nzuruba. Having played 4-2-3-1 almost his entire time in charge, Fowell lined his team up in an assertive 4-4-2 formation. And they ran riot. With a pair of goalscoring strikers, wingers, and an actual keeper (rather than a selfless club legend) in goal, it was possibly Fowell’s strongest line-up yet. And then you take a step back, and you look at the rest of the season. At the fixture list. And you start to take some Clapton players’ tweets about having a go for the league a bit more seriously. Because, it’s not just seven away wins in a row, it’s nine league games unbeaten – and it’s just one league defeat since that horrible little run in October. In this period we haven’t been beating the (with all due respect) makeweights in the ESL, but teams that were expected to challenge this season like Basildon, Waltham Forest, Ilford and Takeley. With our feet firmly on the ground, the prospects of a Clapton title push remain slim. There are two big factors (and a third if you include a resurgent Southend Manor, who currently stand 2nd) that stand in the way of us getting carried away just yet. First, there’s the likelihood of Clapton bringing their away form back to E7. Ten of our remaining fixtures are at home, and while it’s well known that no one likes going to the Dog, with or without hot water, it is a far more imposing place when the Ultras are inside rather than outside. The Basildon win was recorded in silence. Then there’s the fact that the title, in all honesty, is Barking’s to lose. They have the points in the bag and an experienced squad with quality and strength in depth. However, they are still in a couple of cups, and share their frost-and-flood-prone pitch with West Essex. They are already starting to stockpile league fixtures, while Clapton will soon be playing Saturdays only. Any scenario where Clapton emerge somehow victorious would pivot on Barking slipping up hugely. It would also require a drop more dramatic license. But that could also be in store. In keeping with the ESL fixture computer’s sense of humour, Clapton are without a game on the final day of the league season. Were they to sit top of the league by then, their hopes would rest with Barking’s final-day opponents: Stansted, and Mike Walther. It is the hope that will kill us. Prediction: after getting carried away with all these dramatic threads, a dull af 0-0 is nailed on. Clapton Manager Jonny Fowell has announced on Twitter that The Tons will face Ryman North side A.F.C. Hornchurch on Wednesday at The Old Spotted Dog in a friendly fixture. The Urchins have had a reasonably strong season so far in the league a level above Clapton, sitting 9th in a tight division with 28 points from 18 games, 9 points off the top. However they have failed to score in their last 4 games with three 0-0 draws in the league interrupted by a 3-0 loss to East Thurrock United in the Essex Senior Cup. After being relegated from the Ryman Premier in 2014/15, they almost bounced straight back last season, eventually losing 3-1 to Harlow Town in the Play-Off Final after finishing 5th in the league. Founded in 2005 after Hornchurch F.C. folded, the new team were placed in the Essex Senior League where they won the League, League Cup and Gordon Brasted Memorial Trophy treble in their first season. They didn’t cross Clapton’s path however, as the two teams swapped places at the end of the season, The Tons finishing bottom of the soon-to-be-restructured Ryman Division 2, ending a record 101 year stay in the Isthmian League. This Wednesday, Clapton travel up the Shenfield line to Seven Kings to take on historic local rivals, Ilford at the Cricklefield Stadium. This fixture, between two of East London’s oldest clubs, has been played on and off since the two sides were founder members of the Southern League back in 1894. The latest, modern-day, reunion has both facing up for mid-table battle in the Essex Senior League. The Tons should be confident going into this latest encounter, given their recent record with Ilford. The Foxes have yet to record a win against their Newham counterparts since relegation from the Ryman in 2013. The majority of goals have come in Forest Gate, however, with scores of 4 – 0, 4 – 3 & 3 – 3 recorded at The Spotted Dog, and just 3 goals in total scored in the corresponding games. Looking much further back in time does, however, leave you in murky Sevco/Rangers territory. Ilford (1881) fell victim to a series of mergers that eventually led the club to becoming the ‘Redbridge’ bit in Dagenham & Redbridge. The current incarnation of Ilford FC was formed in 1987 and competed in the Southern and isthmian leagues before dropping back into the ESL after a ten year absence. Following a fairly uninspired return to life in the Essex Senior, boss Allan Fenn has taken big steps in restoring Ilford since taking over in his second spell in charge; placing them 5th last season. A former Tons captain, Fenn also played for Dagenham & Redbridge before starting his managerial career at Ilford in 2000, leading the blue & white hoops to 4th in the ESL by the end of his first campaign. Easing into just his second month in charge, Jonny Fowell will be looking to emulate Fenn’s achievements, and a win on Wednesday could propel Clapton as high as 5th in the table. Recent form has Ilford stuttering and Clapton perhaps just turning a corner after 4 points from the last 6. However both teams will be keen to put a largely indifferent October behind them. Ilford, like Clapton, have goals spread around the team this campaign and have struggled to nail down a particular focal goalscorer. Leon Rolle, aka DJ Locksmith of Rudimental, has been a regular starter in midfield for Allan Fenn’s team, although fullback Paul Clayton seems to have most found his rhythm lately, mixing it up with three goals in the last month. Clapton’s model left-back, Tayo Awoderu, had possibly the stand-out performance in last Monday’s 1 – 1 draw in Mile End. With a regular striker still proving elusive, Johnny Ashman’s directness from the wing could prove pivotal. Whoever ends up partnering Jaffa in the backline could also end up being a key position, with Dylan Ebengo impressing at Takeley on Saturday. 0 – 1 Past form suggests this won’t be high scoring and Clapton aren’t particularly prolific at the moment. Ilford have done well against teams below them in the table, but have often struggled against those higher up. Despite a transitional squad, The Tons have had sporadic moments of playing good football, particularly on better pitches. Should have enough about them to edge it.